Have all your calls personally answered in REAL time! If you need to ensure every query is answered and looking for an economic way to do so, then maybe an Aussie based (Cairns QLD) & accented call centre is the answer for YOUR business? 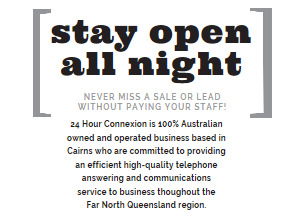 And if it's a situation where you need to MAKE a series of calls to your database for sales, marketing purposes or feedback - then 24 Hour Connexion can do this too!